The USASA National Cup Region III Tournament will be held in Murfeesboro, TN, June 7-9. 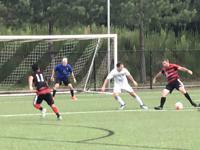 This National Amateur Cup qualifying event is a chance for elite men's and women's amateur teams in the Southeast to play against the best competition Region III has to offer!! R3 Cup winners will move on to represent Region III winners in the in the USASA National Cup Finals. Teams must qualify and register through their state association. For more information on entry please contact Nicole McMaster at 941.313.1858 / nicole@floridastatesoccer.com or contact your state association directly.